Our Personal Site of this Week is Patti Tutton’s. About Patti: Patti is a #GlossBoss who runs a Sola Salon in Chester, VA. As a hairstylist, Patti offer services to men, women and children which range from facial waxing to hair coloring. With over 25 years of experience, Patti believes that with clients: “one size does not fit all.” By forming deep connections with her clients, Patti seeks to help her clients find and create the perfect look for themselves. For her, it’s key that clients feel beautiful inside and out. It’s stunning: Patti’s website is instantly gorgeous thanks to the front page cover photo that she uses. It’s relevant: Potential clients immediately know that Patti’s specialty is working with hair. We adore Patti’s business name: HairBrained. An instantly memorable play on words makes for a perfect website URL and business name. Patti doesn’t just have links to the typical social media platforms like Instagram or Facebook -- she also has a link to her profile on Yelp! 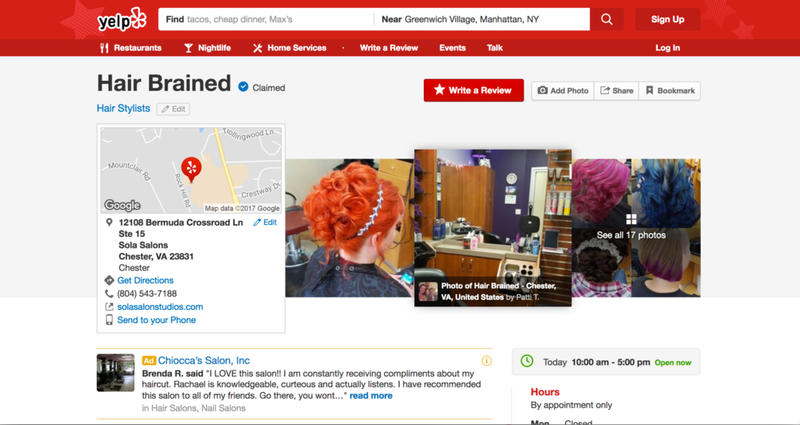 Unlike Instagram and Facebook, Yelp focuses on suggesting restaurants, salons, and other services based primarily off of location. potential clients who are nearby will be able to find her. potential clients will be able to access her portfolio of client photos - even if she has not added client photos to her services. Patti has reduced the number of services that she offers on her booking site to six services. Under each service, she has a short but effective description letting you know what variety of services fall under this service name. This is what allows her to group multiple services together (for example: Standard perm, Beach wave, Spiral wrap are all grouped under Permanent Waves). Price Varies: Rather than promising a set price, Patti puts “price varies” for many of her services. By not setting up her client’s expectations for a certain price, Patti is able to be more flexible in setting her prices on the day of the appointment. Keep your eyes out for our next feature and start thinking -- what will your business brand look like? DM us on Instagram @glossgenius if you want to share any cool personal booking sitess on GlossGenius that you’ve seen as well! Want to set up a personal booking site like Patti’s? Sign up for your free 14-day trial of GlossGenius here!